To submit your sighting, please use the form found at the bottom of this page. A long-term population monitoring program for turtles follows the six species of turtle found at Rondeau. 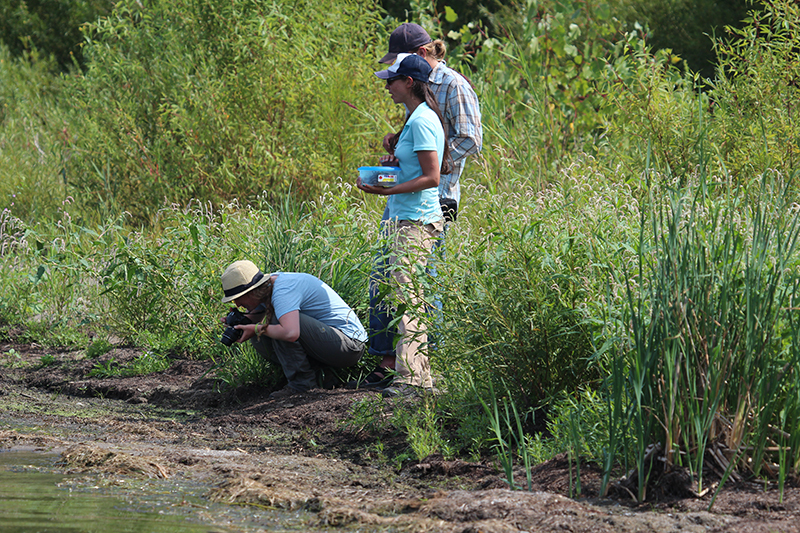 This work includes capturing turtles following specially authorized protocols, and giving each individual a unique, non-harmful identification mark. As marked turtles are recaptured again and again, we can learn a lot about how turtles move around the Park, and whether these turtle populations are stable, increasing, or decreasing over time. By tracking levels of injuries on the turtles we can also monitor the impacts of various threats on these populations – for example, the frequency of collisions with boat propellers, or interactions with fishing gear. In some years, a team of researchers also monitors and protects nests on some of the Parks’ busiest turtle nesting areas. Some nests are collected and placed safely in incubators to maximize their hatching success by protecting them from predators or flooding. The hatchlings from these nests are then marked and released into their natural habitats. This research has also included studies of the behaviour of hatchling turtles. 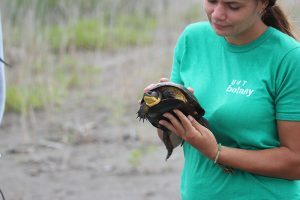 For example, hatchling turtle research at Rondeau has shown that hatchlings of some species can recognize the scent of other hatchlings and possibly even recognize the specific scent of their siblings! 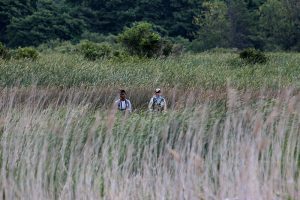 The common reed, Phragmites australis, is a commonly seen invasive plant species in wetlands across southern Ontario. It is a beautiful plant, but it unfortunately outcompetes native Ontario wetland plants and forms very dense stands that are difficult for even humans to walk through. 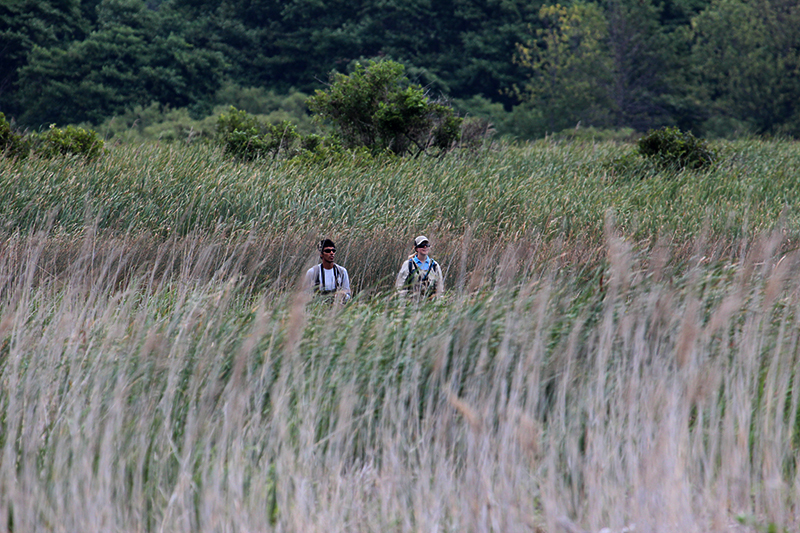 We are tracking turtles at Rondeau to understand how they navigate in and around stands of common reed, and to better understand the impacts of common reed on native turtles in Ontario. Ongoing snake research in the Park tracks the size of the endangered eastern foxsnake population at Rondeau. These harmless snakes are often found in habitats near people, because they find shelter in sheds or under buildings, and because their favorite food – small rodents – is usually easy to find near cottages. Foxsnakes do a great job managing mouse populations, but living near people is risky for snakes because they are often run over by cars. As well as marking and monitoring foxsnakes in the Park to track population trends, we also radio-track larger snakes to understand how they use the different Park habitats, and how they survive in the busier parts of the Park. We have learned that individual snakes have very specific preferences – some stay very near to cottages, roads and campsites, while others head into the middle of the Marsh, far from the busy parts of the Park. Snakes come together during the winter in a few communal brumation sites (brumation is the reptile version of hibernation!). Then they spread out across the Park again the next summer. Usually, snakes return to the same brumation and summer sites as they used previously. But every once in a while one of them decides to try something new – keeping our tracking team on their toes! We have found that some of the snakes at Rondeau have Snake Fungal Disease (SFD), a recently discovered disease that causes skin lesions and sometimes can lead to death. We are now investigating whether this disease only occasionally affects a few individual snakes, or whether its impacts are severe enough to affect the foxsnake population by causing declines. Please submit your wildlife sighting using the form below, we are also interested if you have seen an Eastern Foxsnake, or any other species at risk during your stay at the park.